Required Minimum Distributions: For clients 70 ½ years old or older, Required Minimum Distributions (RMD) must be taken from qualified accounts by December 31st each year to avoid a 50% IRS penalty. Gifting Strategies: Annual gift exclusion amount for 2018 is $15,000 per person. This is the maximum amount you can give to one person this tax year and avoid tax filing implications. Consider Tax-Loss Harvesting: Tax-loss harvesting involves selling a security that has experienced a loss. By realizing or harvesting this loss from a taxable account, investors can offset any gains they experience by these losses. This can reduce an investor’s overall tax liability for the year. Company Retirement Plans: Max out your retirement contributions to take advantage of company matches and reduce your taxable income. College Savings Plans: Missouri residents can reduce their taxable income for state tax purposes by up to $16,000 per household by contributing to college savings plans (529 plans). These plans now allow investors to pay for not only college education costs, but also primary and secondary education expenses. Questions on these financial strategies? 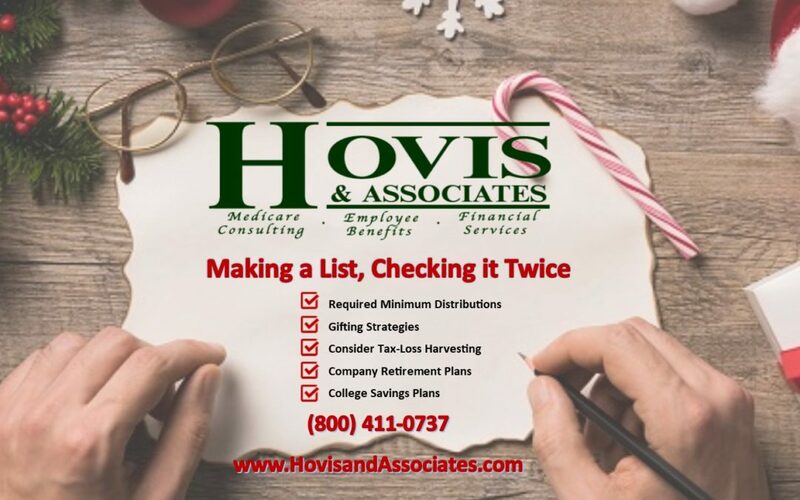 Call Hovis & Associates today for an appointment.